My wife was recently in the market for a new yoga mat. She takes hot yoga classes about 3 times per week at a local studio, and her old Lulu mat had been worn down to the bone. 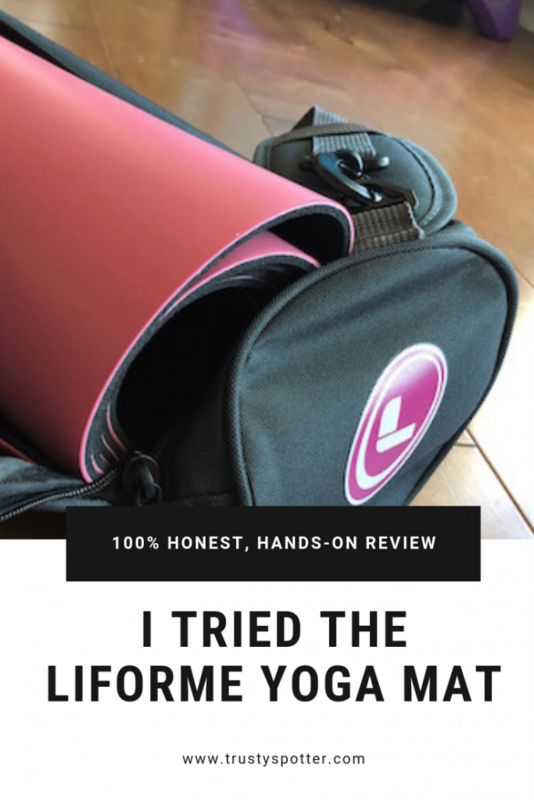 I’d just finished doing some research on the best mats for hot yoga and told her, according to everything I’d read, she absolutely had to try the Liforme yoga mat. 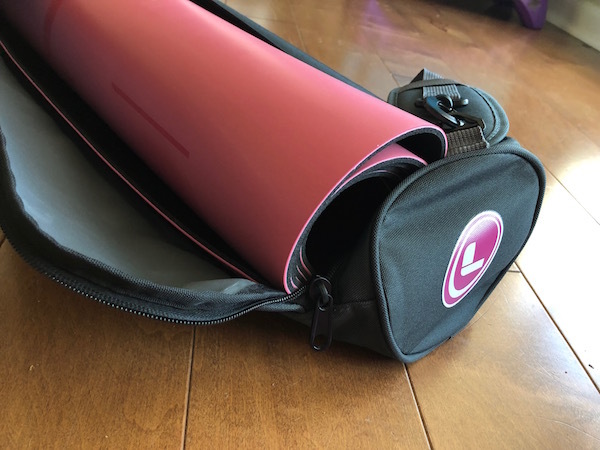 After putting it through the paces at a few high-intensity hot yoga class, here’s our hands-on, in-depth Liforme yoga mat review! Overall, the Liforme yoga mat has been a gamechanger. The grip is rock solid even under extremely sweaty conditions, and the lines on the mat make a massive difference in helping you be intentional about hand and foot placement. Though it’s a little on the heavy side and the included bag can be a bit cumbersome, we’re absolutely in love with the Liforme mat and highly recommend it. But let’s take a little bit of a closer look. What is the Liforme yoga mat & what makes it unique? There are a few pretty awesome selling points of the Liforme mat that make it a great pick, but the boldest and most noticeable thing about it is the alignment lines on the mat. Instead of just a logo or a plain surface, Liforme mats have something called an “AlignForMe,” system etched into the padding. 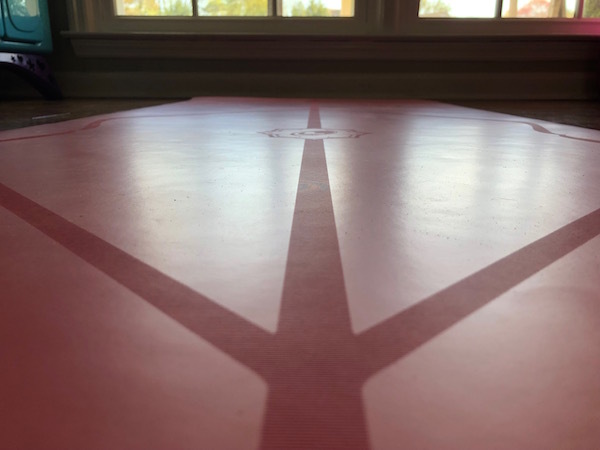 According to Liforme, these lines are specifically designed to help yogis improve their technique, navigate the mat, and provide an excellent foundation for their workouts. I’m not sure I’ve ever read more positive reviews regarding the grip and non-slip texture of a yoga mat. People absolutely rave about this mat for sweaty hot yoga sessions. I wouldn’t consider this an extra tall mat or anything, but it’s a hair wider and longer than your standard yoga mat. Pair that with the alignment lines, and you get lots of space for your practice. These mats are completely PVC free, which is an awesome bonus. Liforme claims these will biodegrade in 5 years or less in a normal landfill if you do ever decide to throw it away. This mat is a tad bigger than your usual mat. Most mats measure in at around 24 inches wide by 68 inches long. The Liforme mat is 26.8 inches wide and 72.8 inches long — a good 2 to 4 inches bigger in both dimensions. 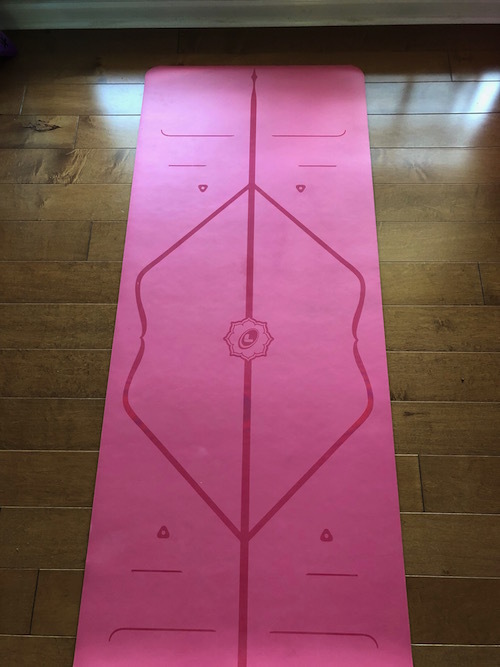 Again, I wouldn’t consider it an extra long mat, but it’s great to have that little bit of extra room if you’re on the taller side or like to really take up the full space of your mat during practice. This yoga mat is also pretty thin, at only .16 inches. That’s a fraction thinner than my wife’s old Lulu mat, but it’s not among the thinnest mats on the market. Weight wise, the Liforme is definitely on the heavier side, weighing in at 5.51 pounds. It’s dense and solid, but not overly bulking. As far as I can tell, there’s no official warranty on these mats. On Liforme’s website, under Shipping & Returns, they mention that you can return a mat within 14 days if you’re not happy with it. But when it comes to wear and tear over time, it’s not clear if they offer a guarantee of the product’s longevity. However, I’ve heard really good things about Liforme brand’s customer service, so if you have an issue with your mat, I’d reach out and I’m sure they’ll help however they can. How do you clean the Liforme yoga mat? This was definitely a big question we had, because we all know how sweaty and gross yoga mats can get if not cared for properly. And that’s pretty much it! Easy peasy. Alright, so we tried it out over the course of a couple of hot yoga sessions. My wife is the yogi of the family, so below I’ll paraphrase her impressions. The grip on this mat is EXCELLENT. It’s extremely grippy and solid without feeling tacky at all, even under really sweaty conditions. There might be a tiny bit of slippage if you’re literally planting in a puddle of sweat, but this mat can hold up to a ton of moisture and still provide insane grip. Liforme calls it “warrior-like” grip. She mentioned that on the old mat, she was having trouble with side planks, but with a better grip her strength on that pose has improved dramatically. It’s also important to note that the bottom of the mat, itself, is extremely grippy. So not only do you not slip on the mat, but the mat stays firmly planted in place on the floor with ease. It’s a comfortable mat, thin but not so thin you feel like you’re practicing on the floor. There’s just enough cushion, but plenty of firmness, for a great practice. We got the pink mat, and she’s absolutely in love with the color. You can also grab it green, blue, or black. As for the lines, some people may or may not like the way they look, but they are a SERIOUS advantage when it comes to your yoga practice. 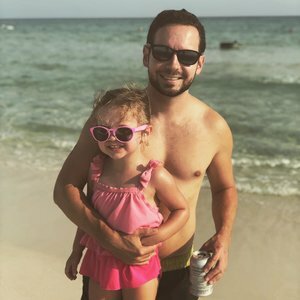 They’ve helped my wife be incredibly intentional about where she’s putting her hands, her feet, and the way she’s spacing her limbs and body. The lines and spots are excellent landmarks for consistency in your poses. It’s common for yoga mats to smell out of the box, and the Liforme was no exception. It had a mild odor when we first opened it up, but nothing worse than your average yoga mat. She reports that the smell wasn’t a factor in any of her classes, even with her nose right on the mat in child’s pose — and that’s saying something because she has an EXTREMELY sensitive nose. So you may not love the smell right out of the box, but it shouldn’t be a problem once the mat has aired out. Alright, so what did we love about it? The grip on this mat is truly unbelievable. I even tried it myself, and the rumors are true… you won’t budge on this thing. 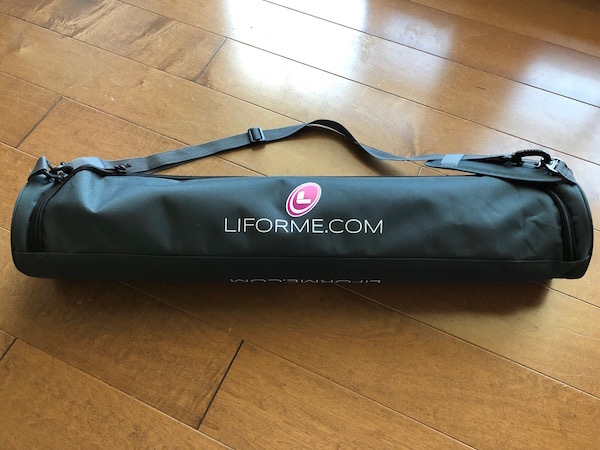 If you’ve ever had trouble with firmly planting yourself during tough poses or slipping around during hot yoga sessions, you really need to try the Liforme. I’ve heard some people find these lines distracting, and if you’re a highly advanced yogi, you may not need them. But a little extra guidance as far as spacing and foot and hand placement can be AMAZINGLY helpful. This is probably the biggest thing that sets the Liforme apart; I don’t know of too many other mats that have this feature. It’s not a complicated piece of equipment with tons of bells, whistles, and features, but it does what it does extraordinarily well. It locks into place on the floor and gives you a perfect surface for your practice. You’d be surprised how much little slips, slides, and adjustments can knock you out of your flow or meditative state. The Liforme mat eliminates those problems and lets you get out of your head and into your body. No getting around it, the Liforme is not the cheapest mat on the market. You’ll want to check Amazon for the latest price, but expect to pay close to twice what you would for most popular mats. Don’t get me wrong, the value and quality are literally off the charts. But this mat won’t fit everyone’s budget. The Liforme mat comes with a nifty carrying bag, which we liked overall, but the bag is a little bit cumbersome. It’s not the easiest thing in the world to get the mat (which is already a little heavy) rolled up and back into the bag, especially when it’s really sweaty. The bag would be awesome for taking a trip, but for day to day use we prefer yoga mat staps. This mat is specifically designed to be a few inches wider and longer than your standard mat, and as such, it weighs a tiny bit more. It’s not bulky or cumbersome, really, but if you’re looking for something crazy lightweight (or you’re super, super petite), this might not be the one for you. What else can we say? We absolutely loved this yoga mat. Higher overall quality — This mat is eco-friendly and made to last. I don’t think I could possibly give it a higher recommendation. All that’s left to do now is for you to check the Liforme out on Amazon for the latest price and more stellar user reviews.